I took the day off today for a doctor appointment. I also got to wash some windows and make two cards! Both cards are pretty much the same design with a few tweaks - and both have the same sympathy sentiment - Holding You Close in Prayer from the PTI set Boutique Borders-Sympathy. 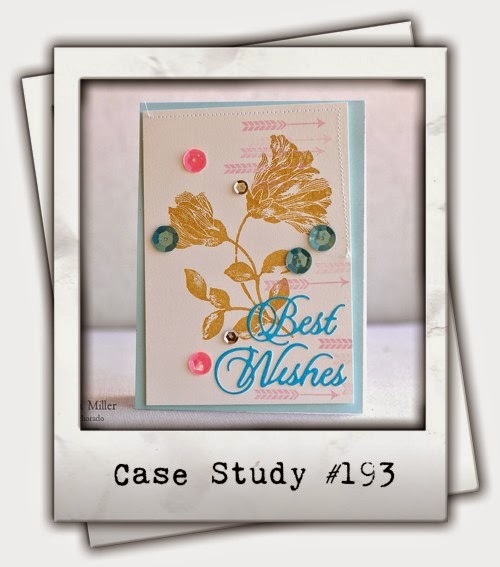 On my first card I also used a fun new stamp/stencil set In Full Bloom from Studio 490/Wendy Vecchi. First you stamp the image - I used Archival Jet Black ink - then you use the included stencil - layering the bloom part over the bloom and sponging the color on (Archival Dandelion) then placing the leaf part over the leaves and sponging them in Archival Leaf Green. A quick way to get this stamp colored! I die cut the panel with the Tipped Top Die from PTI - added some sequins from Avery Elle and stamped the sentiment along the bottom. 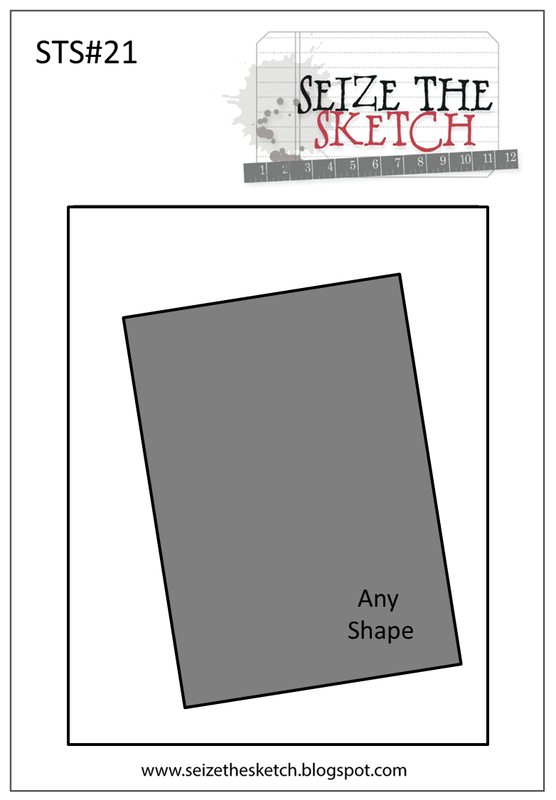 I'm linking this card to Seize the Sketch. For my next card I used the same sentiment from PTI (I need Sympathy cards for my stash unfortunately) - along with a stamp from Harvest Berries. I angled the Tipped Top Die differently and added a wooden butterfly from Prima that I painted with Adirondack Gold Acrylic Paint dabber as well as a few sequins from Avery Elle. I'm linking this card to Case Study #193. The weatherman promises lovely weather here this weekend. Hopefully I'll get into the garden for a while to lay the last of the mulch (no rest for the weary!). There's also a 3 year old's birthday party to go to on Sunday that should be fun! Accessories: Tipped Top Die - PTI, lemonade and Lucky Blend sequins - Avery Elle. Accessories: Tipped Top Die - PTI, Lemonade Sequins - Avery Elle, Prima Wood Embellishments/Stationers Desk. Here's my tag for the 3rd Compendium of Curiosities 3 challenge - to use the Faux Tea Rose Technique that is found on page 65 of Tim Holtz' A Compendium of Curiosities Vol #3. I'm making tags for all of these challenges and putting them in a Tag Book. Here's a close up of the lovely tea roses I created using some text and dotted papers. We cannot share the technique - you need to learn it from your own copy of Tim's book. But I can share how I put my tag together! First I adhered some Symphony Tissue tapes on my #8 Manilla Tag. I painted over the whole tag with Bundled Sage Distress Paint, spritzed it with water, dried it and sponged the whole tag with Walnut Stain Distress Ink (which pretty much covered all the Bundled Sage paint!) then I flicked water on the tag again and blotted it with paper towels. then I stamped a leaf Art Parts with Studio 490 Reverse Dots using Archival Fern Green ink. I just pressed the leaf onto the stamp - don't the dots look cute on the leaf?! Next I made my tea roses and leaves. I used pretty text and dotted papers from the Cowboy Paper Pad from My Minds Eye and sponged them with Vintage Photo. 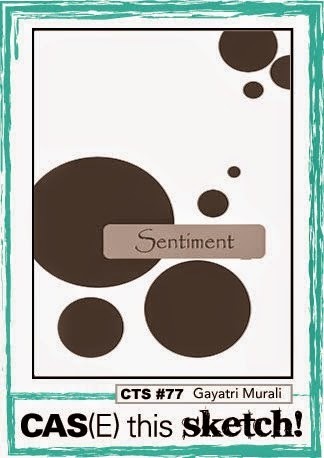 I also stamped a sentiment from the I Am My Art set from Studio 490 on a Journaling Ticket and sponged the edges with Walnut Stain. I added some Remnant Rubs Botanical at the top and bottom of my tag. and a Philosophy Tag that I brushed some Bundled Sage Distress Paint over to highlight the word 'Imagine' I attached it to the Linen Ribbon that I looped through the hole with a Wire Pin. I stapled the stamped Journaling Ticket to the bottom of the tag and added a moth from Salvage Stickers/Crowded Attic with a foam dot. The mushroom is a Remnant Rub/Botanical. Here's my finished tag, once again. 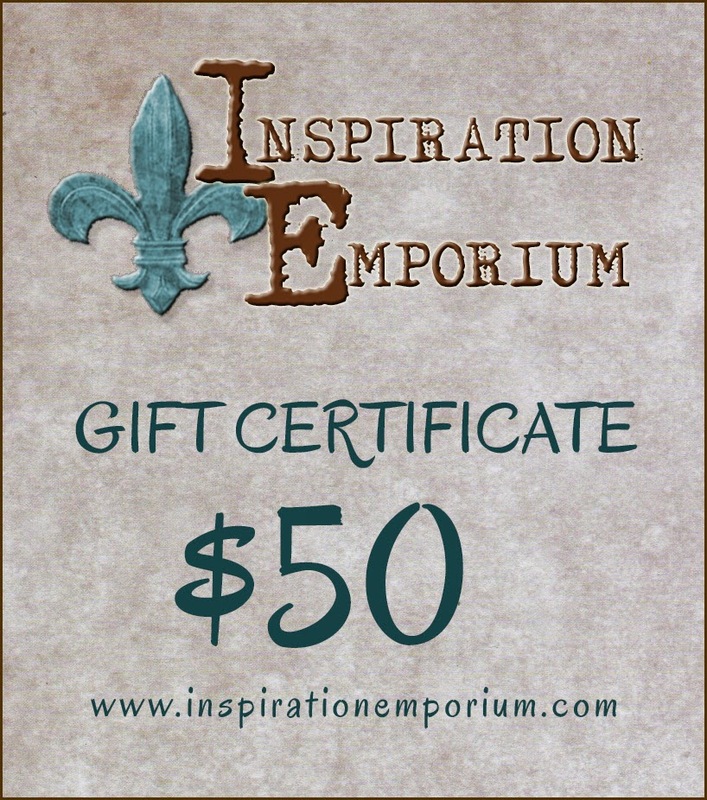 There are several prizes to be won with each CC3 Challenge - there's a new one every other Saturday - this week one of the prizes is a $50 gift certificate from the Inspiration Emporium! So be sure to check out the challenge here! Stamps: Reverse Dots, I Am My Art - Studio 490 Wendy Vecchi. Accessories: Ideology - Salvage Stickers/Crowded Attic, Wire Pins, Philosophy Tags, Remnant Rubs/Botanical, Art Parts Leaves, Distress Glitter Clear Rock Candy, Distress Crackle Paint Clear Rock Candy, Glue N Seal - Ranger, Tattered Pine Cone Die - Alterations. I used some new dies that I've purchased from PTI over the past few months (SO happy to use what I purchase instead of just putting it on the shelf!) - the Phrase Play #3 die AND stamp set, along with the Bitty Button Stacks dies. I used Aqua Mist and Berry Sorbet card stock (I guess I ran out of Melon Berry?!) but I did use Melon Berry Ink! I'll be at church when the hop goes live at 10 am EST - so I'll be linking up a couple of hours later when I get home. 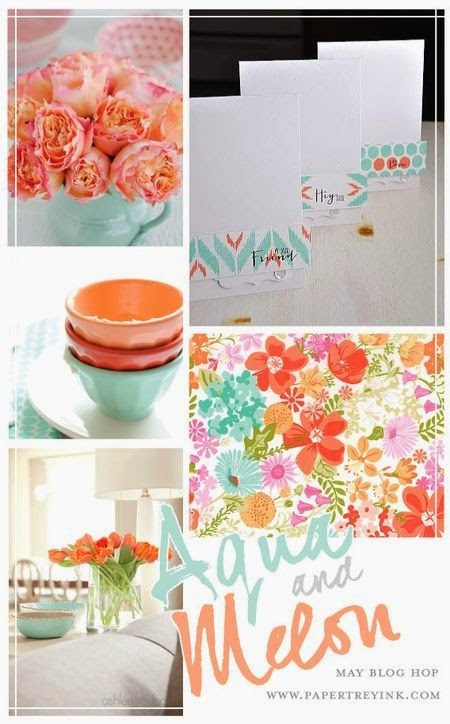 I'm sure there will be lots of lovely spring and summer designs with these pretty colors! Accessories: Dies - Phrase Play #3 and Bitty Button Stacks - PTI, Stitched Mat Rectangle Die - Lil' Inker Designs, foam dots. Today I have a clean and simple masculine Birthday Card to share using a wonderful nautical stamp set from Waltzingmouse called Ocean Bound. 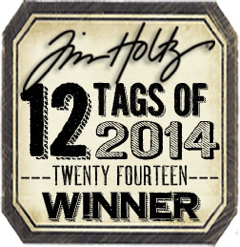 The kraft tag is cut with a Stitched Tag Die from Waltzingmouse - and the circle die is from Lil' Inker Designs. I'm entering this card in the Keep It Simple Challenge - Maritime. 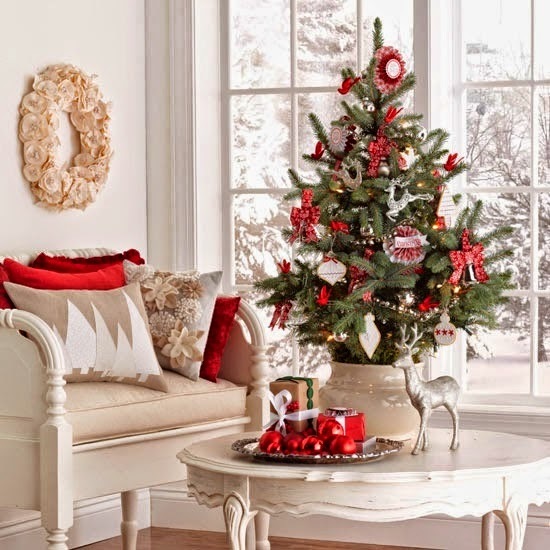 A short and sweet post - for this first day of the Memorial Day long weekend here in the US - I'm going out to lunch with my sister at Pickity Place - a wonderful gourmet restaurant in a lovely old home in the woods of Mason, New Hampshire! Here's what we'll be having! Accessories: Stitched Tag Die - Waltzingmouse, Stitched Mat Circle Die - Lil' Inker Designs, foam dots. Today I'm happy to be playing along with the A Vintage Journey Challenge #6 - All About Him. 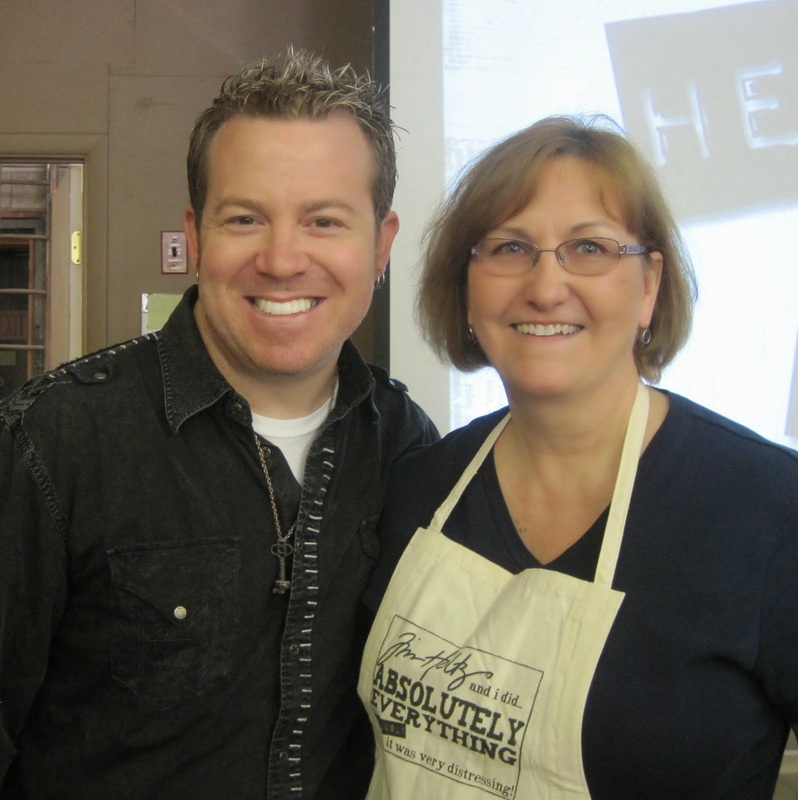 Anne is our host for this challenge and in her words: "I have chosen 'All About Him' as my theme. Men are usually difficult to make things for but with Tim Holtz's range of stamps, dies and accessories it does make life so much easier! So with Father's Day just around the corner, this is a perfect chance to create something. 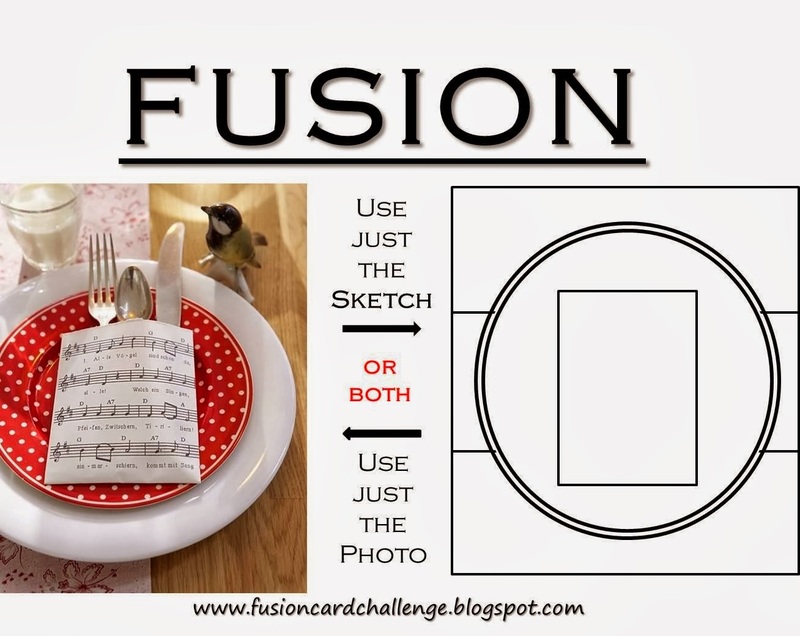 This challenge is to make a card/tag/3D or any other type of project specifically for a man, using Tim's techniques or products wherever possible." I made a tag for my project - while I'm learning to design with Mixed Media - the size of a tag is just right for me to work on! And - I'm going to be making a Tag Booklet to keep my tags in. I'll place them on my kitchen counter or my desk at work so I can flip through them and admire all my handy work! So - here is my All About Him tag - my dad passed when he was just retired - suddenly - at the age of 66 (when I was 27) so I just made this tag masculine and not about a dad particularly. I used an architectural window stamp from Classics #16 and a pediments die (that I cut from Grunge Paper - inked and then adhered Ranger Distress Tarnished Brass Glitter to). I used metal - with the Heart Charm,(I love these little hearts!) Time Pieces with Game Spinners, (that I inked with Orange Blossom, Cornflower Blue and Leaf Green Archival inks) the Ring Fastener, the Trinket Pin and black paper string. I made the background by placing some puddles of Ranger Distress paints (Mustard Seed, Rusty Hinge and Bundled Sage) on my nonstick mat - spraying with water and then dragging the tag through it. I dried it with my heat gun then sponged over it with Vintage Photo and black soot Distress Inks. I inked a damask stencil designed my my friend Mona over at MFT (I don't have a Tim one!) on the tag using Vintage Photo Distress Ink - you can just see it above - I layered so many things over it! I added Remnant Rubs/Life Quotes, Industrious Stickers/Borders (that I inked with Orange Blossom and Leaf Green Archival Inks) and Chit Chat stickers. I placed a number Salvage Sticker on a Journaling Ticket adding a Blossom Bucket black star, another Remnant rubs/Life Quotes and Chit Chat Sticker Then I spritzed all over the tag using the Distress Marker Spritzer with a Black Soot Distress Marker. Ok, I'm finally DONE explaining it all - and I'm happy with it! 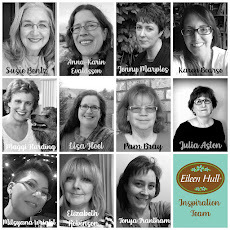 Come and join us at A Vintage Journey Challenge! Ink: Ranger Distress - Black Soot, Vintage Photo; Archival - Orange Blossom, Cornflower Blue, Leaf Green. Accessories: Ideology - Journaling Tickets, Salvage Stickers, Remnant Rubs/Life Quotes, Chit Chat Stickers, Trinket Pins, Black Paper String, Heart Charms, Ring Fasteners, Time Pieces, Game Spinners, Industrious Stickers/Borders, Ranger Distress Tarnished Brass Glitter, Grunge Paper - Ranger, Damask Stencil - My Favorite Things, brown Twine - Waltzingmouse, Distress Marker Spritzer - Ranger, Black Soot Distress Marker - Ranger, Ranger Distress Paints - Mustard Seed, Rusty Hinge, Bundled Sage. Wow, wow, wow - did you see all the wonderful bright yellow with contrasting black designs linked up at the Fusion Challenge the past two weeks??! It is always quite a challenge for the Design Team to pick their favorites - you guys really rock the Fusion!! This week we have another fun inspiration photo - I just love the red with white dots, and the music bag - and the sketch pretty much matches the image this week! I've 'sort of' combined the two with my project. The silverware in the photo immediately made me think of a package of sweet little plastic forks I just had to purchase when I saw them at my local Christmas Tree Shop - I just knew I'd use them sometime! - at 4" long, they are supposed to be used for appetizers - aren't they the cutest?! I had these Bazzill Library Pockets sitting in the cubby that's on top of my work table - they've been there for years - just waiting for me to be inspired to use them - which happened this week! I stamped the front twice with a stamp from the Musical Background set by Waltzingmouse using Archival Watering Can Ink. The cute tag with the little heart around the hole was cut from the new Folding Tag Die set from Waltzingmouse. I looped a little piece of red/white twine through the hole. I die cut the dotted red Amuse cardstock (another item I've had for years!) with a Mega Mat Stack 3 die from PTI and die cut the slots for the gift card to slip through using the Gift Card It Die from Waltzingmouse. Here's a pick showing the panel inside and pulled out. I didn't really want to put the Library Pocket on a card base but I thought it would be nice if it could stand up and be displayed - so I cut an easel with my Tim Holtz Small Easel die from a piece of white PTI card stock, which is very sturdy, and adhered it to the back of the pocket with ScorTape - Perfect! I made two of these cuties - so I'm all set to give some gift cards when the need arises! Now - I can't wait to see how the rest of my Teamies were inspired by this weeks' challenge - let's go see, shall we?! 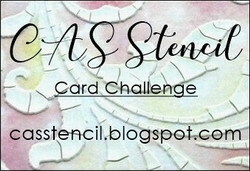 Please join us by linking up your inspired creation over at the Fusion Card Challenge Blog - you have almost 2 weeks! 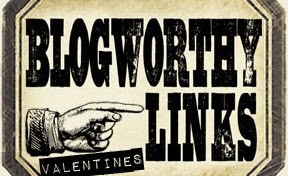 Stamps: Gift Card It, Join Us, Musical Backgrounders - Waltzingmouse. Paper: White and Pure Poppy - PTI, Dotted DP - Amuse, Bazzill white Library Pocket Card. Accessories: Dies - Gift Card It and Folding Tag Die - Waltzingmouse, Small Easel Die - Tim Holtz Alterations, Mega Mat Stack 3 Die - PTI, Modern Label Punch - SU, foam dots, ScorTape, thick glue Dots, Maraschino Twine - The Twinery. 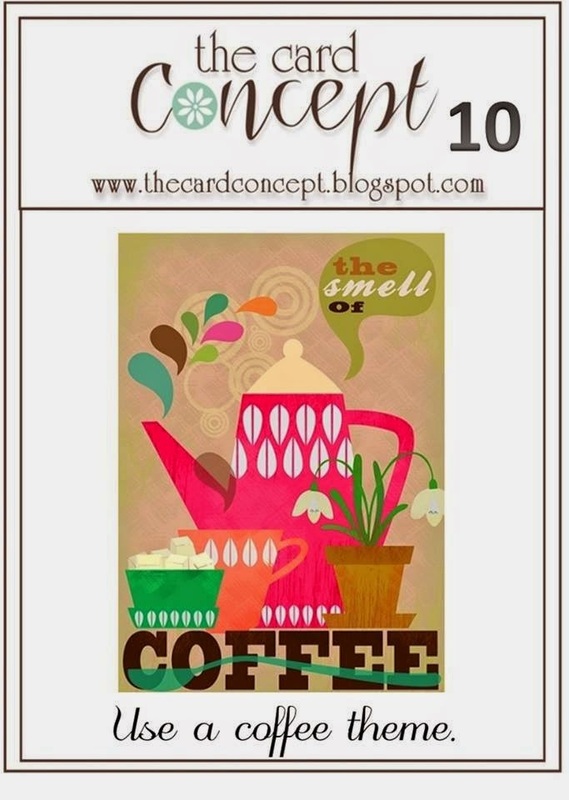 Creations by AR - Designers Choice Blog Hop!